I am working in San Francisco this week. On my way to our office, large screens in the lobby of one of the buildings downtown caught my eye—they were showing a vivid display of the cover of the most recent issue of Fortune magazine. It was Salesforce’s headquarters, and the cover featured the company’s CEO Marc Benioff. That’s not really a surprise—as one of the world’s most successful technology companies, Salesforce deservedly gets its share of coverage in the press. But a prominent list of company names on the cover made me pause and take notice. 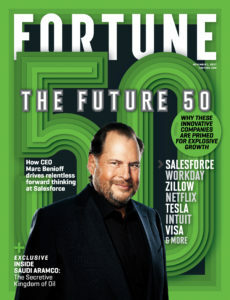 Echoing the famous Fortune 500 list, the Future 50 are the publicly-traded companies Fortune considers to be the most forward-thinking and best-positioned for future market impact. When I later looked at the full list of 50 on Fortune’s website, I realized that 10 of the businesses—that’s more than a third of the software and SaaS companies listed—are SparkPost customers. To be honest, seeing these customers recognized for the great work they’re doing confirmed what I already knew: they’re remarkable businesses. But it did strike me as meaningful to see so many customers named in a single list like this. If nothing else, it demonstrates they collectively understand the power of email to support the high-growth applications and services they’re building. Consider just a few of the Future 50: Zillow uses email to nurture user engagement in and outside of its app. Workday is building email into its workforce enterprise SaaS product. Twitter relies on email notifications as a key growth surface for its service. Salesforce itself knows that email is essential throughout its marketing and CRM suites. And so many other companies in this list have a similar story. I and my team give heartfelt congratulations to our customers and the other innovators that made this inaugural list of the Future 50. We’re also excited to help them—and all of our customers—grow and shape the ways we work and use information. In a nice coincidence, the reason for my trip to San Francisco is to host a roundtable of some of our customers. I’m looking forward to congratulating those that made Fortune’s list in person—and also to supporting them and every one of our customers as they continue to do great things with email.